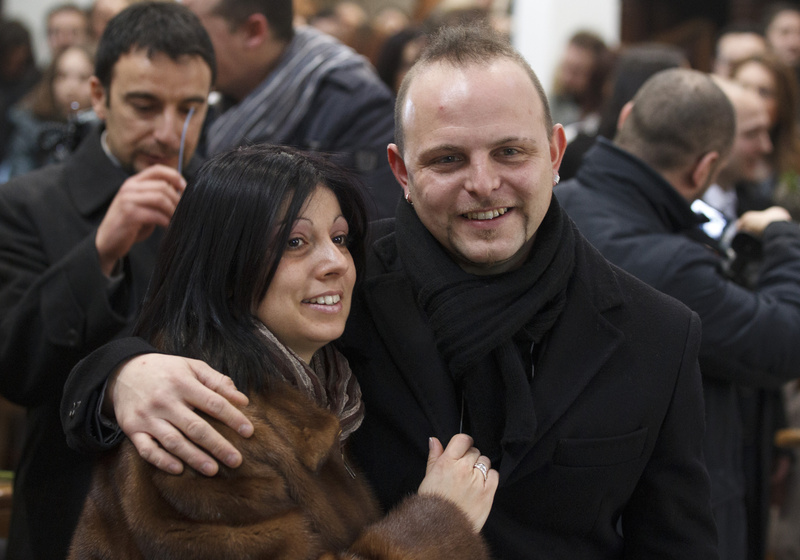 Emanuele Masci, 29, from Terni, Italy, and Virginia Theresa Yim, 32, from Toronto, share a moment after a special Mass for engaged couples at the Basilica of St. Valentine in Terni, Italy, Feb. 10. TERNI, Italy (CNS) — Holding hands as they processed into church, 101 couples approached the mortal remains of St. Valentine, invoking his protection and promising that their upcoming weddings would bind them to one another forever. 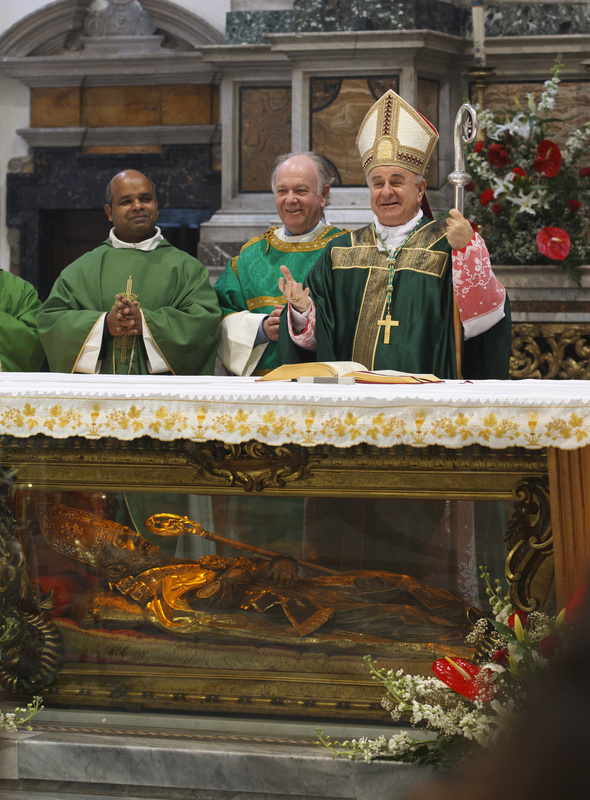 The couples, all of whom live in Italy and have scheduled a church wedding in the coming year, gathered Feb. 10 in the Basilica of St. Valentine for the annual “promise Mass,” celebrated the Sunday before the feast of St. Valentine, the third-century martyred bishop of Terni. Archbishop Vincenzo Paglia, president of the Pontifical Council for the Family, presided over the Mass and told the couples that “in a world that no longer understands love and marriage and family,” their promises are an affirmation that true love is forever and that marriage involves an openness to having children. Maria and Pasquale, two 33-year-olds from Rome, said they heard about the promise Mass late last year when their parish priest, who was leading their marriage preparation class, brought the whole class to the basilica for their final session. “It’s beautiful to make a promise here, before St. Valentine,” said Pasquale, who, like many Italians, identified himself only with his first name. But Vincenzo, 36, and Patrizia, 30, drove four hours to Terni from their home in Benevento “more for ourselves than for a religious thing. It’s like a good luck wish for our wedding,” Vincenzo said. Virginia Theresa Yim, 32, of Toronto, and Emanuele Masci, a 29-year-old from Terni, were also among the couples crowded into the tiny basilica. “It’s a promise, something sweet, to strengthen our marriage,” Masci said. The bride-to-be said that for her and Masci, marriage is sacred, and the sacrament is important both for them and their families. Masci said, “It’s not easy to find someone with the same values in a small town; I had to go across the ocean.” The two met in Greece. The ages of the engaged couples participating in the Mass approximated the general statistics for Italy, with very few under 30 and several over 40. The average age for marriage in Italy is 34 years for men and 31 years for women, according to figures released late in 2012 by Istat, the government’s national statistics office. As the couples sipped coffee in the frigid morning air waiting for Mass to begin, Archbishop Paglia greeted them, one by one, asking where they were from and thanking them for coming. In his homily, he told the young couples that if they — like many of their peers — thought it really was impossible for a man and woman to be married and love each other for life, then they would not have come to the promise Mass. But the fact that they are asking St. Valentine’s protection and assistance, he said, means they recognize how difficult it may be to be faithful and loving forever. Archbishop Paglia told them the key to marriage and family life is to spend time together, to talk, to try to understand each other and, especially, to be willing to forgive one another.